The tiny village of Siurana can be found in the province of Tarragona, a few of kilometres North-West of Reus. Low-cost airlines like RyanAir fly to and from Reus Airport almost daily, which makes planning your vacation and booking a car rental fairly easy. Rarely does a conversation with a Spanish climber go without Siurana being mentioned at some point. So when I finally found myself standing underneath the Can Melafots sector one warm summer evening in 2004, I couldn’t help but feel I had accomplished a lot by just getting there! Like Rodellar, the village of Siurana is literally at a dead end, right next to a long and winding canyon, with cliffs dropping down several hundred feet from all sides. The three main sectors are split up along the road leading to the village. The main sector, Cingles de la Trona, is behind the village and runs along the top of the valley making for a spectacular view. The climbing here is quite traditional and may surprise first-timers with lots of tricky crimps and balance movements. It's worth working your way down to the ledge below to visit Can Piqui Pugui which is one thouroughly impressive wall with awsome routes. Development over the past years has been focused on Barranc de Fontscaldes, specifically Siuranella, with plenty of new lines being bolted every year. The routes offer a diverse experience, whether you are just starting out with lead climbing, or looking to red-point strong test-pieces like Anabolica (8a). Since there is so much to do, it’s not surprising that many climbers tend to extend their stay here, often renting out cottages for months on end. The orange limestone is in good condition although some of the more frequented sectors have already seen heavy wear and tear, specifically along the Cingles de la Trona. Siurana is a very popular destination for the Spanish, especially during summer. The weekends bring truckloads of climbers and tourists, which doesn’t make for the best atmosphere. I would recommend retreating to sectors like Grau dels Masests on days like these. Otherwise, the scene hear is quite relaxed and peaceful, with many friendly people from all over the world. Climbers looking to push their limits should definitely visit Barranc de Fontscaldes and check out sectors L’Olla and La Siuranella. The climbing there is very athletic, with sharp under-clings, tortuous finger pockets and long tufas combining for some very imaginative and inspiring routes. Most climbers sleep in the Can Melafots sector either on the cliff itself, in the car park, or at the local campsite. Bouldering up the small ledge left of the parking brings you to a great space above the sector which is optimal for sleeping or just chilling out, as you are partly hidden from the people below. There is also a campsite run by local legend Toni Arbones with a small bar where you can eat meals and check the latest info concerning new routes. Toni is the publisher of the Siurana topograph and this can be purchased for €10 (Caravaca & Arbones, "Gui d'escalades Siurana"). The village of Siurana has two clean water fountains for drinking. On the weekends the villagers sell wine from the farmers along the valley and the small restaurant also opens. All other supplies need to be purchased from Reus however, since there are no supermarkets in the close vicinity. I can highly recommend Siurana to anyone looking for a couple of weeks climbing vacation. The location and good weather guarantee a hassle free holiday and Spain is still one of the cheapest places to visit. During my stay in 2004 I had both beginners and advanced climbing friends along, and everyone was able to find something to work on without feeling frustrated. 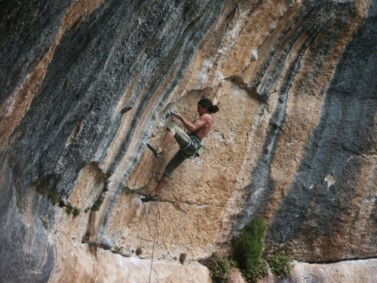 There is also no denying that it pays to be strong here, as some of the best routes are 7b and higher. 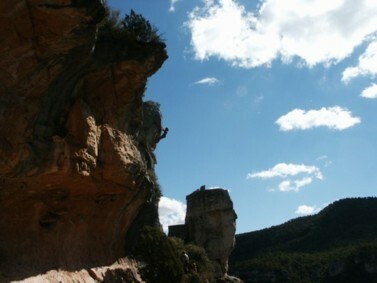 So pack your climbing gear and hop on the next flight to Reus for an unforgettable experience!